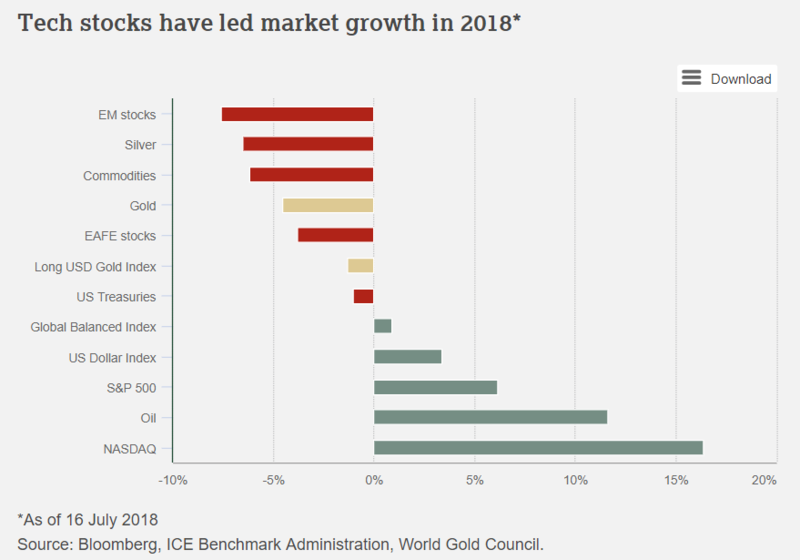 Momentum may be turning for gold and combined with attractive entry levels, the World Gold Council believe that these trends will increase gold’s relevance for investors in the months ahead as we enter the period of positive seasonality for gold. September tends to be gold’s best month with the gold price tending to increase in August, November and especially September. i) Wealth and economic expansion: periods of growth are very supportive of jewellery, technology, and long-term savings. ii) Market risk and uncertainty: market downturns often boost investment demand for gold as a safe haven. iii) Opportunity cost: the price of competing assets such as bonds (through interest rates), currencies and other assets influence investor attitudes towards gold. iv) Momentum and positioning: capital flows and price trends can ignite or dampen gold’s performance. The confluence of key trends, as highlighted for the second half of 2018, could be supportive of gold demand. In addition, gold’s recent pullback will likely support consumer demand as lower prices have historically increased jewellery buying. For investors, gold’s current price range may offer an attractive entry level, especially since net longs linked to COMEX gold futures are at their lowest level since mid-2017. And money manager net longs, a subset of the broader metric, are close to zero – a level not seen since 2015 when gold hit a multi-year low. Historically, such a scenario has coincided with a rebound in the price of gold, as even a small catalyst for investment demand may caught speculative investors with a large exposure to short positions. Finally, while the summer period tends to be a quiet period for gold buying and trading – as seen by softer seasonal demand, lower trading volumes and sideways price movement – the gold price has tended to increase in September as consumers prepare for a traditional buying period and investors rebalance their portfolios before the end of the year.